Another fossil of snakes with legs has been found. At first, the response might be, "Big deal", until people realize that the critter had four legs. This has received attention in both creationist and secular circles, especially since it's causing slime-to-snake evolutionists some consternation and dispute. The "image Generator" picture does not do justice to French newscaster Melissa Theuriau. This one is more flattering. The dispute is whether or not the fossil is that of a snake. It has many snake features, but also not snake features. Although it had legs, don't get it fitted for cowboy boots because those legs weren't walking legs, but appear to be used for grasping. It is considered a terrestrial snake, not a marine one, which adds to difficulties for evolutionists to place it in the proper alleged transitional sequence. But they can't find an evolutionary order for it because snakes were created, they didn't evolve. Their photographs and description recently appeared in Science. So did their evolutionary conclusions. 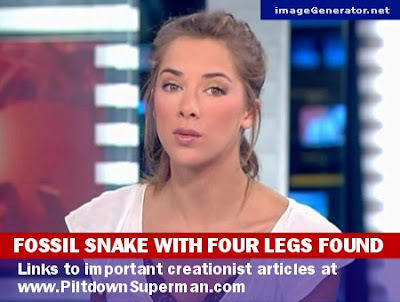 To read the rest of the article, click on "Four-Legged Snake Fossil Found in Museum". In addition, you might want to supplement your knowledge by heading over to "Snakes with Legs?" and "A four-legged fossil snake: A serpentine version of Archaeopteryx?"